The Moorestown Rotary Breakfast Club donated $200 to the organization. Featured in the picture are Cathryn Sanderson Executive Director, Back on My Feet Philadelphia Chapter, Chris Chesner, Past President & Board Member & Jeff Dey, Rotary President. 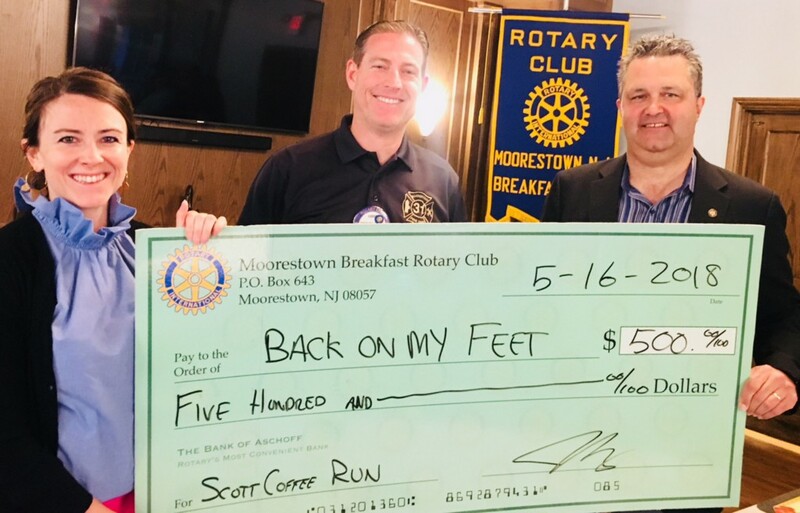 The Moorestown Rotary Breakfast Club welcomed Cathryn Sanderson Executive Director, Back on My Feet Philadelphia Chapter, last week and donated $250 to help move the organization forward. Back on My Feet seeks to revolutionize the way society approaches homelessness. Their running-based model demonstrates that if you first restore confidence, strength and self-esteem, individuals are better equipped to tackle the road ahead and move toward jobs, homes and new lives. For all in need, they provide: practical training and employment resources for achieving independence; an environment that promotes accountability and a community that offers compassion and hope. For all with the capacity to serve — volunteers, donors, community and corporate partners — they seek to engage you in the profound experience of empowering individuals to achieve what once seemed impossible through the seemingly simple act of putting one foot in front of the other. To date, the club has funded total scholarships of more than $250,000, general charitable donations exceeding $150,000, Paul Harris Foundation support over $135,000, an annual technology school / college scholarship program, an annual back pack school program, Rotary Youth Leadership Award ( RYLA) scholarships, participating in the Moorestown Citizen of the Year, Christmas gift card to middle school needy children & families and Rotary District 7500 projects; shelter box, Gift of Life, Polio Plus & Gift of Life. In addition, the club has been named custodian of the Jeff Young Park in Moorestown, and will be responsible for maintenance and spring readiness, and sponsoring the Jeff Young Scholarship given annually to a Moorestown High School student.